Pharmacy is a dreadful job. Who can really stand for 8-12 hours straight verifying prescriptions, dealing with medical insurance, with mean customers, having no bathroom or lunch break, working overtime then coming back the next day to repeat it all again? To many people, being a pharmacist means you must be amazing or just insane. When I started pharmacy school, I thought the same thing. But after three years in this field, I would say pharmacy is a very interesting and unique profession that is vastly misunderstood. 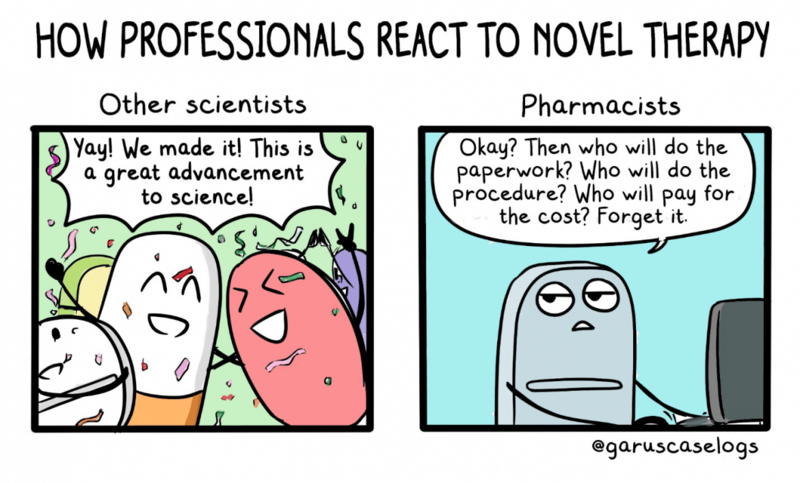 I hope my comics work about pharmacy school can show what it is like to train and work as a pharmacist. Comics were an important part of my childhood. I spent most of my school life doodling all over my textbooks. I carried my love of comics throughout my college years, and I even dreamt of combining art and pharmacy together as my career goal. But when I started pharmacy school, everything changed. The atmosphere was unforgiving and stressful; I was so overloaded with coursework, research, organization and activities that I did not have enough energy to draw. Drawing comics became a luxury to me, and over time I thought that my dream of combining comics and pharmacy was finished. But then my journey took a turn when I accepted an internship at the US Food and Drug Administration (FDA). For two months, I worked with the most wonderful and intellectual professionals, from whom I learned so much. I wanted to show my thanks to these mentors, but did not know how. Then I realized that a comic was the best way to record this experience and my gratitude to these people, so I made my first comic about my intern experience, and, much to my surprise it was very well received by the reviewers there, who were generally serious people. 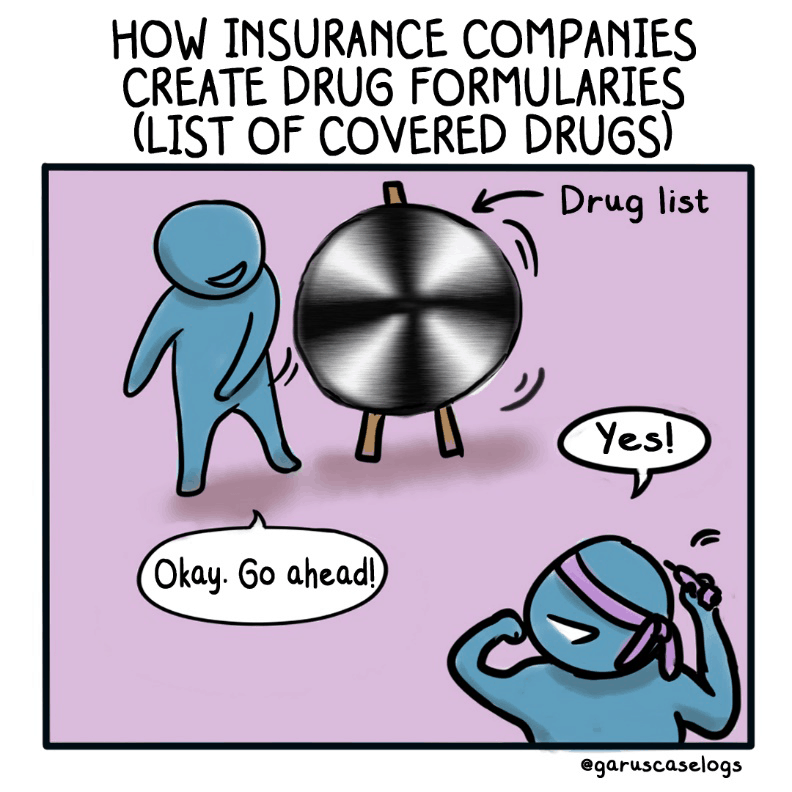 Their positive feedback inspired me to record my experiences at pharmacy school through comics, and thus the blog “Garu’s Case Logs” was born. The title is a pun on the patient “case logs” – patient encounters that pharmacy students must document. Each story is four to six panels long and does not follow any particular theme. I took advantage of my experiences in different fields like retail, regulation and research to reflect as many aspects of pharmacy as possible. Interestingly, the more I publish stories about working in this field, the more I recognize the shortage of pharmacy stories in the public domain. Despite being the most accessible healthcare provider, pharmacists are rarely represented in visual media: a study shows that they were portrayed only 264 times in 50 years, and most of those representations were in negative roles like a villain or a victim (‘the pharmacist did it!’). Almost all pharmacy-related content on the internet is about retail pharmacy rather about the broader rolls that the pharmacist plays. Although there are some amazing blogs about pharmacy struggles out there, few of them seem to reach the general public or help patients understand the profession. Figure 3. 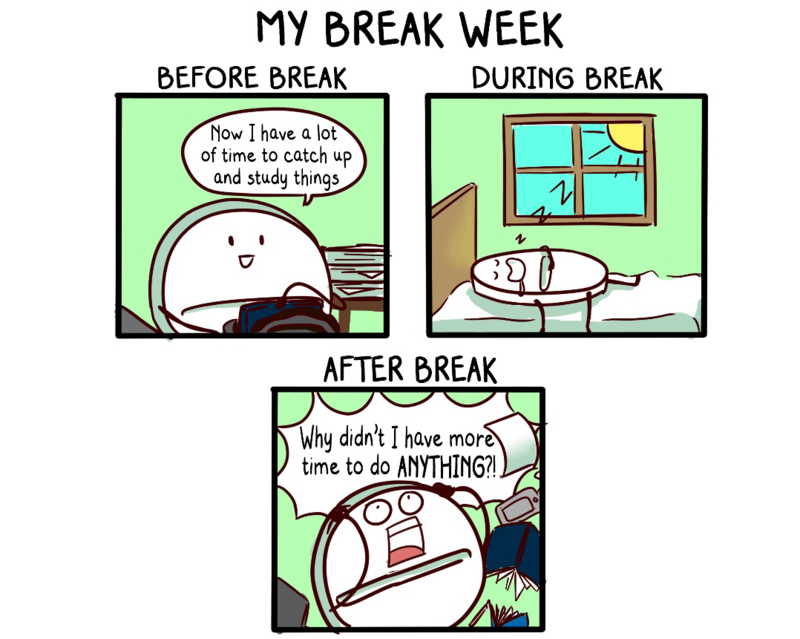 The power of procrastination. 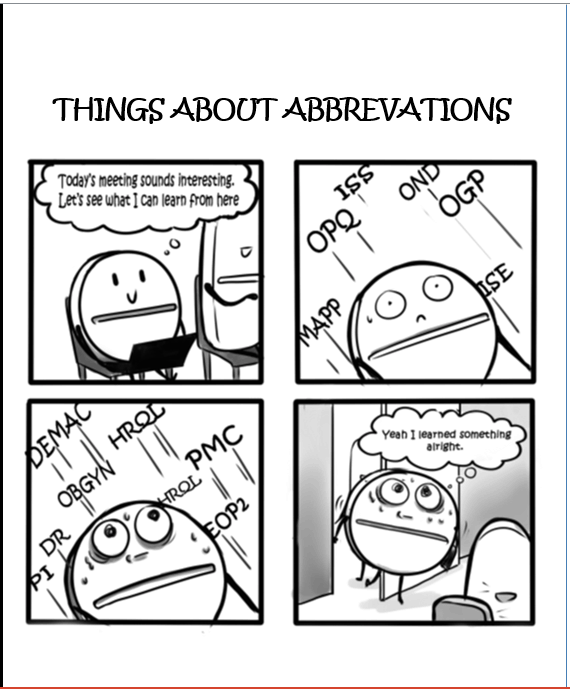 Through the informality of the comics medium, pharmacists could express their work and ability, thus presenting themselves to the public in a more adaptive and humorous way. Pharmacists are trained to break down technical information into patient-friendly language, thus they can provide excellent insights in some difficult and misunderstood fields like regulation, industry, or insurance. The simplicity of the comics medium could help explain medication information to patients who have poor health literacy. Furthermore, comics could help pharmacists express their opinion about sensitive topics like healthcare cost or drug usage. Pharmacists have the advantage of not being prescribers, yet working directly with each stakeholder party (e.g insurance and patients) and so providing a more holistic and unbiased perspective about drug pricing problems. For example: last year the FDA approved a breakthrough therapy called CAR-T cell therapy for leukemia patients. It was a giant leap in cancer treatment because the therapy uses the patient’s own immune cells instead of drugs or antibodies. Many providers and scientists celebrated this amazing technological advancement, but many pharmacists remained skeptical because they knew that insurance companies would not cover the therapy, thus making it unaffordable to the public. This, indeed, turned out to be the case: CAR-T therapy is not generally available because it is too costly. figure 4. What people think of an innovative treatment. Giang Ho is a fourth-year pharmacy student. She grew up in Vietnam, travelled to the United States to study pharmacy, and is now studying at University of Iowa. When not dealing with pharmacy and comics, she likes to read and sleep (with a lot of snoozing). She can be found on Twitter, Instagram and Facebook as @garuscaselogs. Very proud of you Giang Ho! This is terrific! I would love to share it with some of our pharmacy students here in Massachusetts! Nice one post.. really helpful thanks for the sharing with us. Giang, so very proud of you and glad that you are combining your creativity and profession! So cool to see.